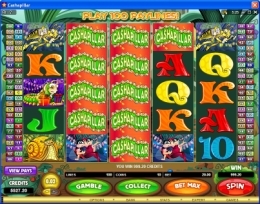 Play a Free Demo of Cashapillar and many other Microgaming Slots. The hits can be amazing in this 5 reel, 100 payline bonus slot even when wagering only 1¢ or 2 ¢ per payline, the maximum coin denomination you can bet. Of course you can up the number of coins per pay line up to 10 if you want to bet higher. The Cashapillar Logo is a stacked wild symbol and substitutes for all other symbols except the cake scatters which triggers the free spin bonus round. A stacked wild symbol can cover every payline on the reel it lands on for some really big winning combinations. It is even possible to get all 5 stacked wild symbols at once. All payline combinations that include the Cashapillar Logo wild symbol are automatically doubled. Two Cake scatters double your win while three or more trigger a 15 free spin bonus round. Each win during the free spins are automatically tripled and when combined with stacked wild symbols can pay upto 6 times your wager. Play the free spins can be retriggered for some really top paying bonus rounds. You can win 6 million coins ($120,000) betting maximum during the free spins bonus feature or 2 million coins ($40,000) while in regular play. Cashapillar includes some colorful bug character symbols that also pay pretty good, especially during the free spins or when combines with the stacked wilds. The Cashapillar symbol pays 1000 for all 5, 200 for 4 and 15 for 3. The Lady Bug pays 400 coins for all 5, 100 for 4 and 12 for 3. The Snail pays 300 coins for all 5, 80 for 4 and 10 for 3. The Rino Beetle pages 250 coins for all 5, 75 for 4 and 7 for 3. The Wasp pays 200 coins for all 5, 50 for 4 and 4 for 3. An A(Ace) K(King), Q(Queen), J(Jack) and 10(Ten) round out the lower tier symbols. You'll get quite a bit of playing time from CashaPillar and will be amazed at how much you can win playing only 2¢.